It’s an extreme step taken by Chief Roy Fox and council to keep drugs and drug dealers off the First Nation as deaths related to fentanyl and other opioids continue to rise. Now, a permit system has been instituted, and in some cases as much as $500 annually will be charged for companies owned by non-members. The fees for the permits are meant to help offset the cost of the program, said the council. The aim is not to punish or control visitors, according to band communications officer Rick Tailfeathers, but to aid police in better identifying those who do not have permission to be on the reserve. The bylaw won’t affect those travelling on the provincial highways that cross the reserve or those attending public events such as powwows or hockey games on the reserve. 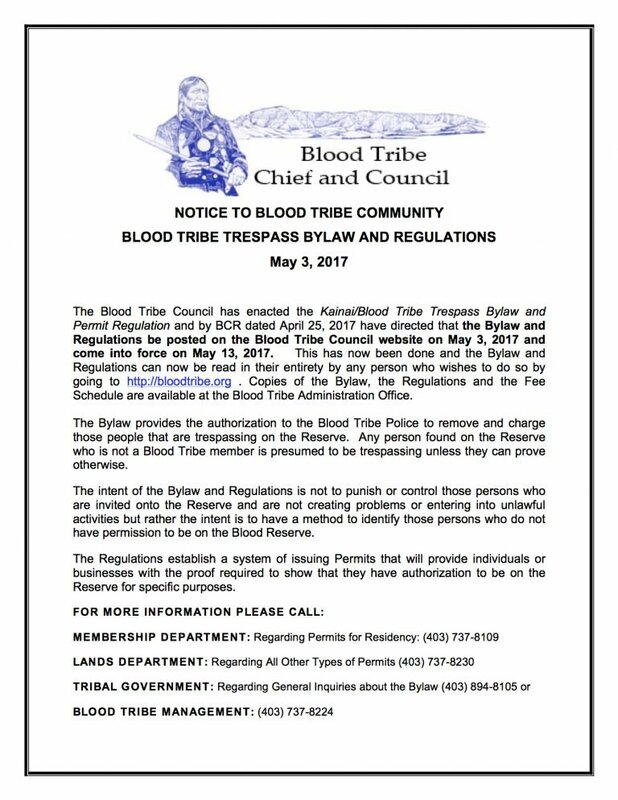 Blood members have had a mixed response to the bylaw, said Tailfeathers. The trespassing bylaw was initially proposed late last year. Band member consultations took place before the bylaw was ratified this month.